Image: Trader reading CFD Global financial news. On Friday, the dollar fell against the Japanese yen as dismal U.S. manufacturing data fuelled worries about the wider economy, and Treasury bond yields signalled growing fears of recession, Reuters reported. Even so, the dollar rose against the euro as a much weaker-than-expected German manufacturing survey raised concerns that Europe’s powerhouse economy might be slowing. Image: Turkish lira tumbled 5.8% on Friday. Last week it came as a surprise when Turkey’s central bank announced a surprise tightening of monetary policy and moved to calm concern over a sudden drop in official reserves in a failed attempt to slump in the lira which tumbled on Friday as much as 5.8%. The central bank announced it will be making steps to push lenders towards its more-expensive overnight borrowing facility. According to Bloomberg, a central bank official said late Friday that a drop in official reserves during the first two weeks of March wasn’t anything out of the ordinary, citing foreign-debt repayments and sales of hard currency to state energy companies. • grim manufacturing data from Germany and the U.S. that reignited fears of a slowdown in the global economy and oil demand. A senior executive at state-run PetroChina, China's biggest gas importer and producer, said late Thursday that the Power of Siberia natural gas pipeline from Russia to China is on track and gas supply is expected to commence by December 2019. This is one of the most anticipated energy projects in Asia and it is expected to eventually pump 38 Bcm/year of natural gas from East Siberia to China. "Currently the pipeline construction process is right on track and we think we can hit the target to get the supply by December 20, 2019," Ling Xiao, PetroChina's vice president and head of the gas and pipeline business, said at a briefing in Hong Kong. "According to the agreement, Russia will supply 5 Bcm of gas in 2020 and will increase the annual volume year on year to hit 38 Bcm in 2025." Image: Gold settled higher Friday. 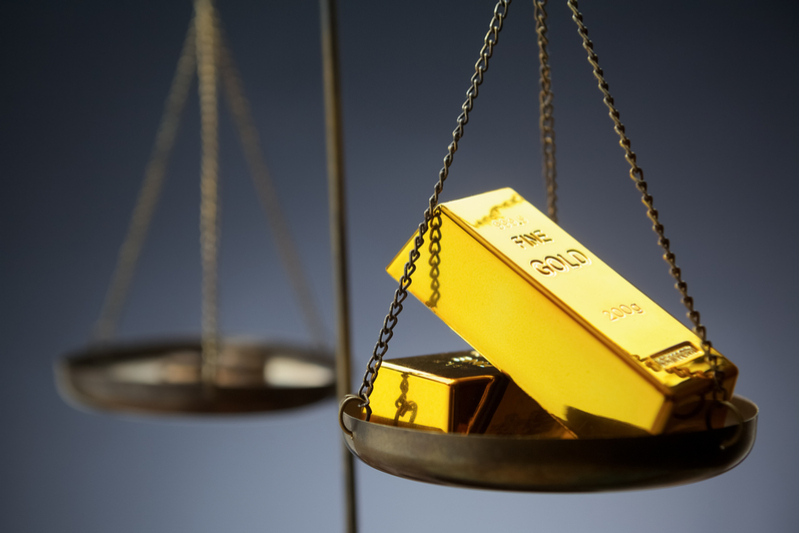 Economic data fed global growth worries and gold settled higher Friday as investors reacted to fresh global growth fears and a recessionary alarm bell sounding in the bond market. Gold for April delivery GCJ9, +0.41% on Comex rose $5, or 0.4%, to settle at $1,312.30 an ounce. It scored a weekly gain of 0.7%, which marked its third weekly rise in a row, according to FactSet data. The most-active contract logged its highest finish since Feb. 28. • Nasdaq Composite Index COMP, -2.50% slid 2.5%. 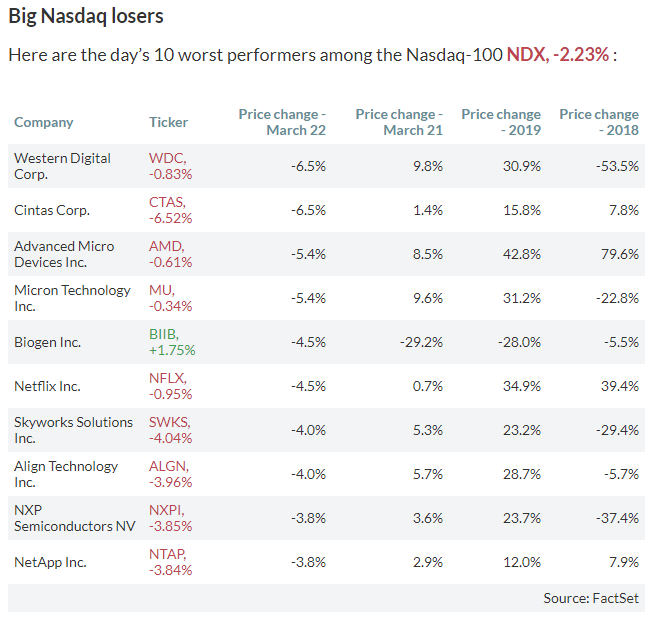 Image: Nasdaq 10 worst performers on Friday, 22.03.2019. European Shares Deepened Losses Due to Dismal Data from the U.S.
• the London and Paris bourses sank more than 2 percent, while Frankfurt and Madrid fared only slightly better with roughly 1.5 percent declines. 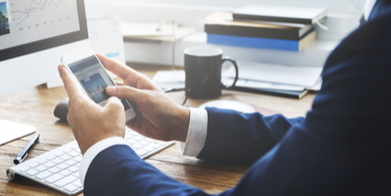 Facebook (FB) is making it easier for customers to buy products they like, while Instagram is leveraging its popularity among consumer-oriented brands, which have preferred to advertise their products on the photo-sharing app. Now, when a user finds on the app a product he/she likes, he/she will be able to buy it without leaving the app. Instagram will keep a small cut of such a transaction. When Instagram launched this initiative, Facebook stock rose 0.6% on March 19. Apple (AAPL) hares have rallied 23.6% year to date, outperforming the S&P 500 composite’s growth of 13.4%. According to Zacks Equity Research, this can be attributed to the buzz related to the upcoming event on March 25, where the iPhone-maker is expected to launch the much-anticipated video streaming service. Even more, the move to update and upgrade its iPad and iMac devices along with the recently revealed next-generation AirPods helped Apple in gaining attention of investors and Wall Street analysts. 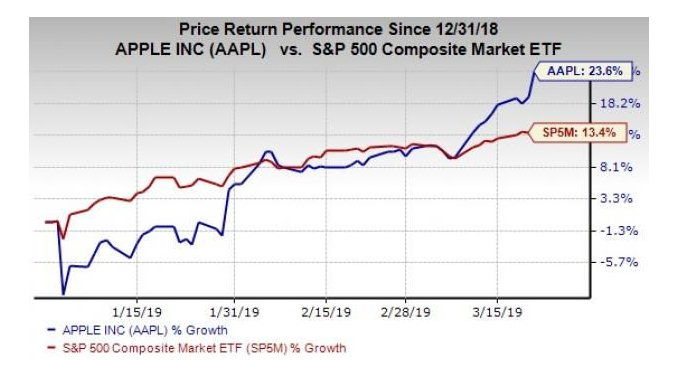 Image: Price Return Performance Since 31.12.2018 – Apple Ince vs S&P 500 Composite Market ETF. Amazon's (AMZN) advertising business had a stellar 2018, more than doubling year over year to reach about $10 billion. Analysts don't expect much of a slowdown in 2019, with expectations of greater than 50% growth (i.e., the same amount on an absolute basis). But some analysts have already raised concerns that the online retail giant is reaching the point where increasing the number of ad units it shows could negatively impact the shopper experience. Amazon's solution is to focus on delivering greater value to advertisers. Its latest product to do so is a mobile video ad unit within its app. The company is currently testing the product in its iOS app with plans to expand to Android this year, according to Bloomberg. Netflix, Inc. (NFLX) is off to another hot start to 2019, and RBC analyst Mark Mahaney expects that bullish momentum to continue. He reiterated his Outperform rating and $480 price target for Netflix. Alphabet (GOOGL) shares had gained 6.74% over the past month. This has outpaced the Computer and Technology sector's gain of 4.76% and the S&P 500's gain of 2.14% in that time. Wall Street will be looking for positivity from GOOGL as it approaches its next earnings report date. The company is expected to report EPS of $10.55, up 6.24% from the prior-year quarter. Meanwhile, Zacks Equity Research latest consensus estimate is calling for revenue of $29.98 billion, up 20.59% from the prior-year quarter. For the full year, our Zacks Consensus Estimates are projecting earnings of $47.40 per share and revenue of $131.79 billion, which would represent changes of +8.47% and +19.7%, respectively, from the prior year. 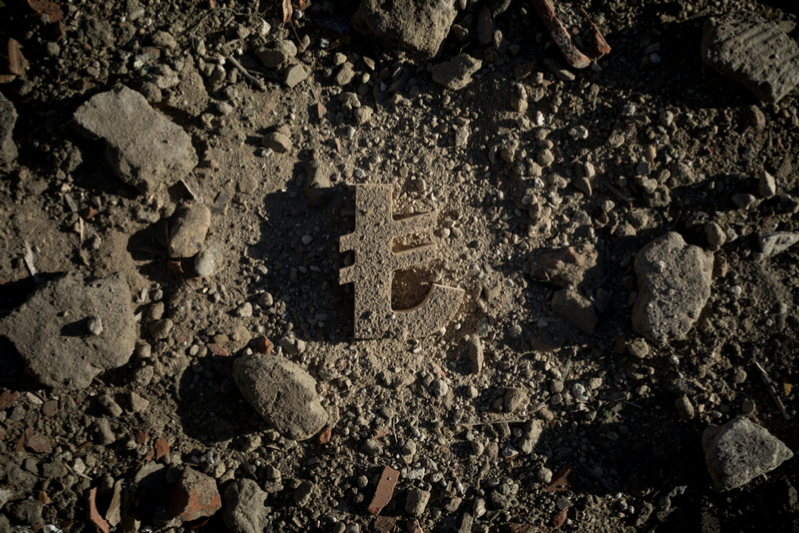 Sources: Reuters.com, Bloomberg.com, SPGlobal.com, MarketWatch.com, Articles.Marketrealist.com, Finance.Yahoo.com and Nasdaq.com.